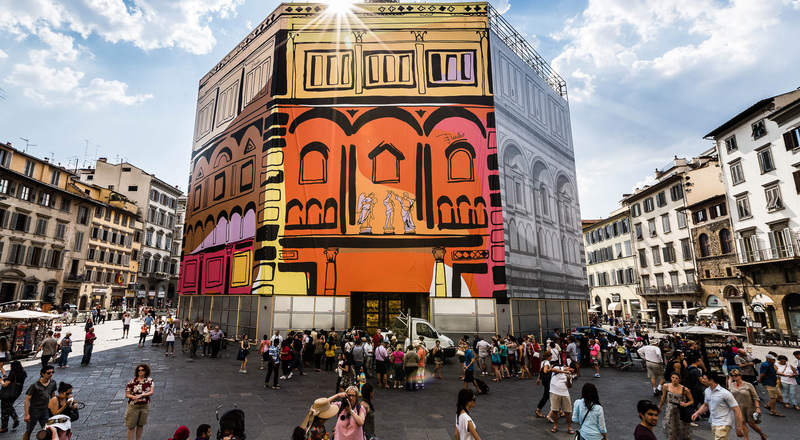 Emilio Pucci celebrates the Florentine fashion heritage with the art installation Monumental Pucci. Unique printed panels “wrap” the historic Battistero di San Giovanni, the monument that inspired one of the most iconic prints ever created by the House, the “Battistero”. The initiative is part of Firenze | Hometown of Fashion, a special programme of events celebrating the 60th anniversary of the Centre of Florence for Italian Fashion, which is taking place during Pitti Immagine Uomo. In 1957, inspired by the magnificent architectural treasures of his home town of Florence, the Marquise Emilio Pucci designed a scarf print interpreting the aerial view of the famed Baptistery of Piazza San Giovanni in vibrant colors of the Mediterranean landscapes: lemon yellow, orange, fuchsia and the emblematic Emilio pink. Now, this remarkable print wraps the medieval monument in a stunning installation created in conjunction with the City of Florence and with the special contribution of the the Ministry for Economic Development and the Italian Trade Agency. The apse side of the Baptistery is clad in the original “Battistero” print, reproduced in its entirety, while the remaining seven sides of the octagonal building are covered in almost 2,000 sq mt of printed canvas depicting a close-up of the “Battistero” design, blown up to life size, faithfully following the building’s contours. In celebration of this artistic initiative, on June 18 and 19, Pucci offered visitors to its Florence flagship an opportunity to “Design the Dream” and discover the drawing and printing savoir-faire behind the iconic piece, as well as to purchase the re-edition of the iconic “Battistero”, launched for the occasion.